Home Secretary Sajid Javid has defended the plan to deport up to 50 people to Jamaica on Wednesday – the first such flight since the Windrush scandal. He said they were foreign nationals who had committed “serious crimes”. But campaigners insist some of the men are being unfairly targeted by the government’s “hostile environment” immigration policy. One of them, a former British Army soldier who suffers from PTSD, has been granted a last-minute reprieve. An estimated 500,000 people from Caribbean countries arrived in the UK between 1948 and 1971 and became known as the Windrush generation. They were granted indefinite leave to remain, but changes to immigration law in 2012 meant many who arrived as children, without their own documents, found themselves unable to prove their status. Some were subsequently held in detention or removed, despite having lived in the UK for decades, prompting widespread outrage. Home Secretary Sajid Javid said last year that at least 63 members of the Windrush generation – 32 of whom had been labelled foreign offenders – may have been wrongly deported to Jamaica. In the Commons on Tuesday, Labour MP David Lammy asked Mr Javid how he could be confident that none of the men due to be deported on Wednesday were also victims of Home Office mistakes. Mr Javid hit back, insisting that none of those being deported were British citizens, or members of the Windrush generation. “Every single one of them has been convicted of a serious crime,” he said, and deporting them was “a legal requirement” under the 2007 UK Borders Act. One of those awaiting deportation is Owen Haisley, a 41-year-old from Manchester. He entered the UK on his mother’s passport as a four-year-old, and at the age of 11, was granted indefinite leave to remain. However, those imprisoned for a criminal offence lose that right and have to reapply, and when Mr Haisley did so after completing a jail term for assault in 2016, his application was rejected. “I’m not a repeat offender,” he said. His children are aged five, seven and nine, and he says he will now only be able to see them in summer holidays, and over Skype, until he can apply to return in 10 years’ time. “How can somebody tell me that I can bring my children up like that or that they will be better off with just their mother?” he said. Father-of-five Twane Morgan, 36, was due to be on the flight, but an injunction, granted on Tuesday evening, means his case will be looked at again. Mr Morgan arrived in the UK in 2003 and joined the Army the following year. He was discharged in 2007 with post traumatic stress disorder (PTSD), after two tours of Afghanistan, but had not served long enough to become eligible for British citizenship. 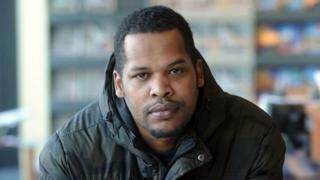 In 2011, Mr Morgan – who was living in Birmingham – was jailed for six years after assaulting a man. He served three. The Jamaican High Commissioner, Seth George Ramocan, said although it was “the same community we are dealing with” – the Jamaican community – it was important to be clear that there was a distinction between members of the Windrush generation and other migrants. “Britain is a sovereign country… we have to abide by what the law of the land is,” he added. However, Mr Ramocan had called for “sensitivity” and “compassion” in the case of Mr Morgan. Karen Doyle, from the group Movement For Justice, which organised a protest outside the Jamaican High Commissioner’s office against the deportation, said: “These are people with British accents, Londoners, Mancs and Brummies – who are expected to return to a country they don’t know and if they return – their lives are truly at risk. “The government hopes people will see the detainees as violent criminals who should be brutally removed for the safety of the public. But they’re not. Jacqueline McKenzie, an immigration solicitor from McKenzie, Beute & Pope, said at least one person due to be deported had an application pending to the Windrush taskforce – the scheme set up to assess the cases of those who may have been caught up in the scandal. “It seems to me that we have taken leave of our humanity and the government have an urgent review of the policies and laws which have driven us to deport people – those who have spent most of their lives in the UK,” she added.